Witch ring symbol belly ring designed with a cross as the focal point. Gothic navel ring. Specifications: 14 Gauge (1.6mm), 3/8? (10mm), 316L Surgical Grade Stainless Steel, Rhodium Plated, 5mm ball. Belly Button Ring Body Jewelry. Specifications: 14 Gauge (1.6mm), 5/8″ (16mm), Bioplast Flex Barbell, 6mm ball The Flexible Bioplast barbell is both comfortable and colorful. 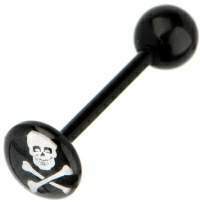 Bioplast� conforms to all world wide standards on use of body jewelry materials. * Bioplast� is Biocompatible. * Bioplast� is flexible. * People pierced with Bioplast� have less swelling and infections. * The healing process with Bioplast� is faster than that of other materials. * No allergic reactions (no nickel) * Bioplast� can be sterilized by autoclave (up to 121�c. shaft only) * Bioplast� is one of the best materials for initial piercing. Get in style with this cool Logo Belly Ring. Sparkling gems surround the photo inlay to create a dazzling navel ring. Surgical Steel Belly Ring.